You can eat this as leftovers, but it’s best after a really short marination–maybe 30 minutes. So chill the watermelon first, and serve it cold. It’s nice as an accompaniment with something light, like grilled chicken. Cut the melon into approximately 1 in (2cm) pieces. In other words, be sensible, and make them small enough that they can fit on a fork, and into someone’s mouth, without being annoying. Slice the onion into thin strips. Taste it, if it’s too intense, lightly salt it for a few minutes, and then soak it in cold water, to lose some of the spiciness. 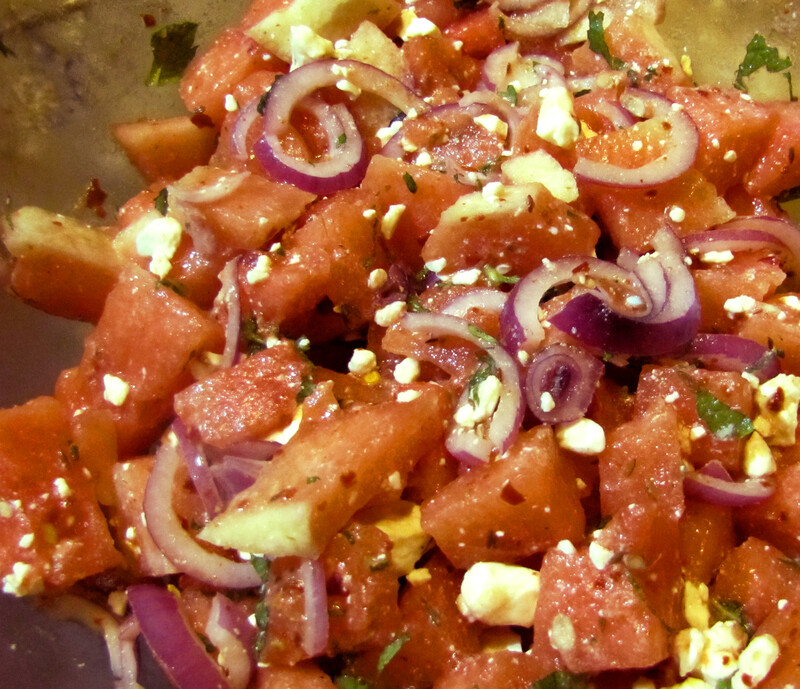 Toss the watermelon together with the onion. Crumble the feta with your fingers, and add it to the watermelon. Tear, or chop, the mint coarsely and add it to the other ingredients, along with the juice of the lemon, the chili, the cumin, and half the salt. Taste, and adjust the salt if needed. Let sit for a few minutes before serving.